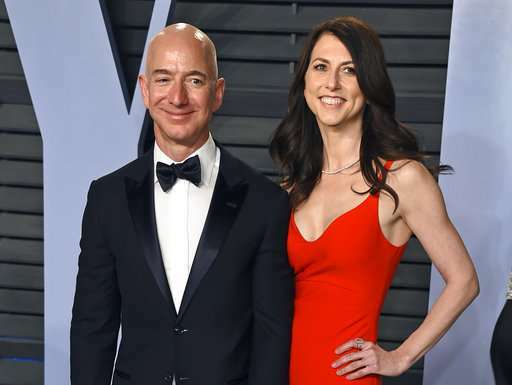 Amazon CEO and founder Jeff Bezos and his wife, MacKenzie, are divorcing, ending a 25-year marriage that played a role in the creation of an e-commerce company that made Bezos one of the world's wealthiest people. But the Bezos divorce seems likely to attract more attention than when Google co-founder Sergey Brin—currently worth $49 billion—divorced his former wife Anne in 2015. Not long after that, Jeff Bezos quit his job at Shaw and started an online bookstore. While his wife did the cross-country driving, Bezos wrote a business plan on the way to Seattle—chosen for its abundance of tech talent. By July 1995, Amazon was operating out of a garage, with MacKenzie Bezos lending a hand, according to a review she posted on Amazon in 2013 panning "The Everything Store," a book about Bezos and the company written by Brad Stone. Amazon has since evolved from an upstart website selling books to an e-commerce goliath that sells virtually all imaginable merchandise and runs data centers that power many other digital services such as Netflix. It also has become a leader in intelligent voice-activated speakers with its Echo products, which are emerging as command centers for internet-connected homes—and a gateway to buying more stuff from Amazon. Give her half....it's only fair. Why is this kak on my science site?